Rajma Chawal Movie Review: Rishi Kapoor leads the cast with aplomb. He is, as always, effortlessly on the ball. Garnished with flavours that range from the mildly pungent to the gently aromatic, Rajma Chawal, a bittersweet father-son drama set in Old Delhi, is instantly appetizing. The crowded, chaotic, colourful location plays a key part in the narrative, serving to reflect the uneasy relationship not only between a sullen young musician and his acerbic dad but also between two generations of Indians, one rooted in the past, the other looking ahead. The principal conflict in the film centres on the struggle within a family - and a locality - to find a meeting point for what has gone and what is at hand. But no, Leena Yadav's heartwarming film, released on Netflix, isn't seeking to paint a big picture of a neighbourhood that is both static and in flux. It offers no startling insights into a milieu that is oft-seen in Hindi cinema nor does it have anything new to reveal about individuals coming to terms with loss, grief and loneliness. What Yadav does, and does well, is keep the narrative simple, light and uncluttered, which makes for consistently enjoyable viewing. Following the untimely death of his wife, Mathur (Rishi Kapoor) decides to move to Chandni Chowk, where he grew up and where many of his childhood friends still live and work. His son, Kabir (debutant Anirudh Tanwar), has no sentimental connect with the place and is mighty peeved at the disruption caused by the shift. The grieving boy has reason to feel hard done by because, among other things, the abrupt relocation has led to the breakup of his band. In no mood to forgive his father who, he feels, did not do enough to save his mother, he all but stops talking to him. If face-to-face talk isn't happening, replace it with Facebook chat, an elderly neighbor suggests to Mathur. 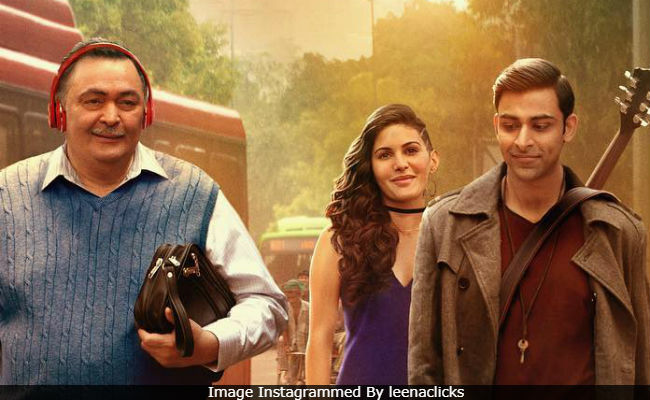 He takes a while to warm up to the idea, but agrees to not only play along but also open a fake Facebook account in the guise of pretty young girl, Tara (Amyra Dastur), to get his reticent son to bare his heart. The gamble is, of course, fraught with risk. It pays off until the point Kabir runs into the real Tara - she is actually Seher, a small-town girl who works in a hair salon - at a nightclub gig. Mathur's well-laid plan goes for a toss. Seher's hotheaded boyfriend Baljeet (Aparshakti Khurrana) throws a spanner in the works and Mathur is compelled to come up with Plan B, which entails his paying the cash-strapped girl to keep the ruse going. The three pivotal characters in Rajma Chawal are all fleeing from a past and grappling with a present that is anything but stable. Mathur's bereavement has been aggravated by perfidious business partner. Kabir is in distress, having lost both his mother and his comfortable New Delhi home. Seher is on the run from her family in Meerut for reasons that aren't divulged until near the end of the film. But while the self-centred older man thinks nothing of clinging to old habits, the two youngsters are determined to move on with their lives. What good are these memories, Kabir asks, when somebody reminds him of the stories of Chandni Chowk that he heard from his mother as a boy. When Kabir, on his part, advises Seher to visit her family for Diwali, she confesses that the doors to her home are shut forever. Rajma Chawal is occasionally marked by simplistic, broad brushstrokes and the film's denouement isn't entirely convincing. It is Yadav's genteel approach to the material - it is a blend of slice-of-life drama and conventional romantic and emotional tropes - that helps the film strike and sustain a steady rhythm. No overly jarring notes interrupt its flow. Rishi Kapoor leads the cast with aplomb. He is, as always, effortlessly on the ball. He receives enough support from Amyra Dastur and Anirudh Tanwar to be able to turn this agreeable tale into an engaging portrait of a social media tyro negotiating the challenges thrown at him by a rapidly changing social and digital environment. At no point does Tanwar look unsure of his screen presence. Dastur, too, turns in an impressively confident performance as the rebellious hairdresser whose own hairdo states her intentions upfront - a long pigtail on one side of the head and a razor-cut on the other, rounded off with a barcode tattoo on the neck. Parts of Rajma Chawal might feel a touch under-cooked, but the rawness is only occasional. The work put in by the technicians is of the highest order. Among them are two internationally feted octogenarians, Australian cinematographer Donald McAlpine (Breaker Morant, Moulin Rouge!) and British editor Thom Noble (Witness, Thelma & Louise), who give the film is distinctive visual texture and narrative pace. The fluid camerawork takes in the alleyways, the terraces, the courtyards and the facades of Old Delhi in an unobtrusive, unflashy manner, enhancing the sense of intimacy that Rajma Chawal seeks to induce.